The Seventies were a pretty amazing time. People danced to disco. They wore bell-bottoms. They watched "What's Happenin'?'" on television. No, really. Meanwhile, superheroes and villains donned some of the most cosmic gear ever seen! Who could forget Luke Cage's iconic tiara, or Angar the Screamer's amazing hippie gear, for instance? What better way to celebrate those time than a custom contest? Our inaugural AFB Forum Contest, "What the Buck?!? ", was a great success, and our custom team are excited to make "That '70s Custom" even better! 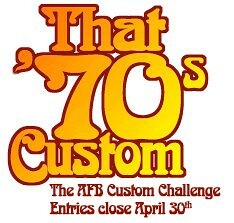 This contest is open to everyone - whether you are currently a member of the AFB Forum or not, whether you have ever attempted a custom before or not. The more the merrier! You can check out the full list of rules and requirements here at the AFB Forum. Please check it out, and spread the word! Entries close on the 30th of April! We're looking forward to a great comp! I have had a few ideas then I do research and it turns out they arn't from the 70's. Can't wait to see what people come up with.